The awards program, in its third year, honors exceptional accomplishments by organizations that support financial advisor success. Award recipients are selected by a panel of judges comprised of top industry professionals. Companies are judged based on the scale, scope and features of the services provided, as well as the innovation and creativity of the delivered services. 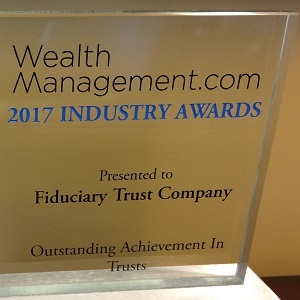 Fiduciary Trust Company was awarded first place in its category at the WealthManagement.com award ceremony in New York City on October 11, 2017. This recognition marks the ninth award that Fiduciary Trust has received in 2017. The firm’s other awards include “Best Independent Trust Company” by Family Wealth Report, “Best Trustee Service” by Private Asset Management and, most recently, “Best Wealth Management Firm” by Massachusetts Lawyers Weekly. Fiduciary Trust is a privately owned wealth management firm focused on families, individuals and non-profits seeking objective expertise to grow and protect their investments. The firm also provides a range of services to professional financial advisors and single family offices. Fiduciary’s capabilities include customized wealth planning, investment management, trust and estate services, and family office and custody services. Fiduciary Trust takes a personal approach based on expertise, strong performance and a genuine commitment to act in its clients’ best interests. The firm’s unique, private ownership and unconflicted investment approach align its interests with clients’ and provide the stability and permanence its clients seek. This commitment to clients has enabled the firm to achieve a 98% average annual client retention rate for over a decade.